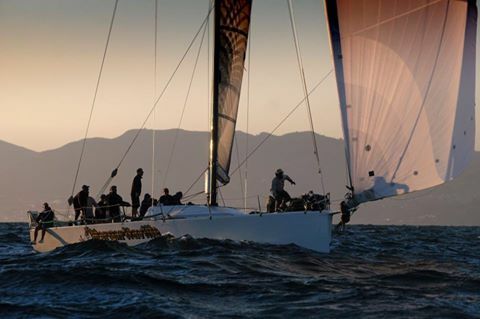 The King of the Hill is the climax to a California Yacht Clubs infamous 21 Wednesday night Sunset Series races. The top boat(s) in each of the Racing Division classes receive invitations, based on final series class standings and average class size. Wildcard alternates are selected to fill out the fleet. This year all seven wildcard boats raced! ​Wind forecast looked ideal and this years edition saw solid 13-15kt winds with a heavy dose of MdR chop on a 2.5mile beat to DD mark and a sprint back to the SF just outside the breakwater. No harbor channel sailing for the 21 racers, it starts and finishes just outside the breakwater. Also what makes this a truly unique race from the typical Sunset race is that it is a pursuit race! Jay Steinbeck’s Margaritaville 1.5 carried the lowest rating and started 17.5 minutes behind the highest rated M242s who started first. The Andrews 52 showed what makes that style of boat very special getting on the step down the run and snuck in just ahead of Duncan Cameron’s Martin 242, Dean (38 sec behind) and then only three seconds later Jamie Myer’s 11-meter, Wolfhound (41 sec behind) crossed the line for a podium finish. After the race it was a good time (as always) on the Cal YC deck for food, drinks, sharing race stories and trophies. Congratulations to all the competitors and next year there again will be 20+ Wednesday Sunset Series races to sail well to hopefully qualify for this challenging and prestigious event.